At the end of the summer season I had the good fortune to head out on the St. Croix River with some of my co-workers. We were relaxing after a long summer of teaching while also scoping out a new route for next summer. While on the river, our director showed us the location of some pictographs on the basalt cliffs. I had heard they were there but had never seen them before. The exact site is known as the Iverson Site. I'm not going to pinpoint it on a map but those with knowledge of geology and the river can probably figure out where they are located. There seems to be a tradition of not saying exactly where they are. I think this is to protect them. I get that but I'm thinking the opposite may also be true. The more people that know where they are the better they may be protected. I have paddled past this location many times without noticing them. Now, if I see someone acting strange at the site I'll certainly be watching for vandalism since I know what is there. You have to know a resource is there if you are to protect it. Like I said though, casual tourist style paddlers won't recognize this site. The kind of people who love the river will be able to figure it out simply from the photo at the top of the post. 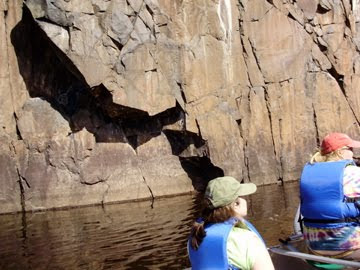 The pictographs are located on a basalt outcropping along the St. Croix River. The rock itself is from the mid-continental rift and is about 1.1 billion years old. The pictographs are naturally much newer. One source I found from the state archeologist's office states that they are considered to be from around 1000 to 1500 AD. This photo below shows all of the pictographs and you can see how easy they are to miss. Go ahead and try to find them in the photo before reading on. In the photo below I have messed with the contrast and levels a bit to bring out the red more. The color is traditionally made by mixing iron rich rock with bear grease or sturgeon cartilage. I've read one source that claimed the rock used was hematite but true hematite is not red so not sure how the logic works on that. This is the main part of the pictographs. The art itself consists of a bison head, two handprints, circles, a cross and a strange dome shape. The strange shape is in the lower left of the photo. The cross or X is on the far left. 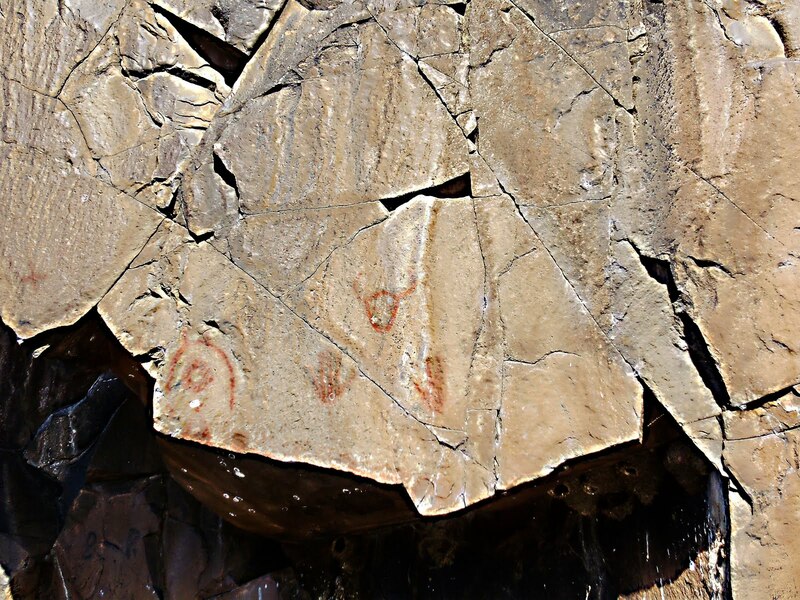 Some sources suggest that an X or cross in pictographs represents either the sun or a star. The circles are not pictured above, they are down and to the right. It is possible there was more to the drawing at one point but the rock may have split and fallen into the river. One source I read speculated that the bison head with the two hands beneath symbolizes a shaman. Click to enlarge the photo and it is much easier to see the pictographs. Here's a line drawing of the pictographs in case you are having trouble making them out on the rocks. The cross/plus symbol is faint and on the far left. I've read that an X can symbolize a star or the sun which is interesting though I still have no idea what these pictographs may mean or how that would relate to the other images present. The photo below shows two rows of dots. These are to the right of the other drawings. I can make out two parallel rows of four. They are very faint. If you try to find this site on the river please don't touch the pictographs. They are part of the history of the river and should be protected.